Today, BriskHeat, a leading provider of flexible heating solutions, introduced XtremeFLEX® RKP Heating Tapes with Preset Thermostats. The new ultra-flexible moisture and chemical-resistant heating tapes feature built-in thermostats preset for a wide variety of heating applications. 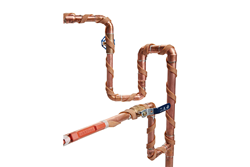 These heating tapes offer a much more flexible alternative to traditional heat trace cable to heat pipes, elbows, flanges, valves, instrumentation, and vessels for freeze protection, flow/viscosity control, condensation prevention, and process control. They can also be used as a flexible heat source for heated hoses. Potential users include facilities maintenance personnel, process engineers, laboratory personnel, contractors, and plant managers in a wide range of industries. BriskHeat’s RKP heating tapes are extruded with moisture and chemical-resistant silicone rubber that is safe to use in outdoor and wet-area wash-down locations. Standard lengths are available up to 200 feet. Standard preset thermostats are either 70 degrees Fahrenheit or 120 degrees Fahrenheit (21 degrees Celsius or 49 degrees Celsius), with a variety of other temperatures available upon request. The heating tapes can also be customized for a variety of applications. For more information about this and BriskHeat’s full line of flexible heating and temperature control solutions, visit http://www.briskheat.com or call 888-501-7491. Since 1949, BriskHeat has provided flexible heating solutions used for freeze protection, condensation prevention, flow/viscosity control, vacuum bake-out, composite curing, and temperature process control. BriskHeat’s primary manufacturing facilities and headquarters are located in Columbus, Ohio. BriskHeat has a worldwide sales network including sales offices in Taiwan, China, Hong Kong, Germany, France and Austria, as well as a manufacturing facility in Vietnam. In 2017, BriskHeat was named to the Inc. 5000 list of fastest-growing private companies in America. Follow BriskHeat on Twitter (@BriskHeat), on Facebook or on LinkedIn.